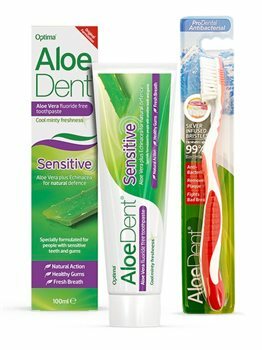 AloeDent Sensitive Toothpaste offers you and your family natural protection for sensitive teeth and sore gums as well as fighting plaque, tartar, cavities and gum disease. A natural based fluoride-free toothpaste with a cool, minty taste. Brushing regularly with AloeDent Sensitive toothpaste offers fantastic triple action: cleaning, protecting and whitening your teeth naturally. Glycerin (vegetable source), Sorbitol (plant origin), Hydrated Silica (mineral origin), Aloe Barbadensis, Aqua, Sodium Lauroyl Sarcosinate (protein derivative), Mentha Piperita (peppermint oil), Xanthan Gum (natural origin), Menthol (natural origin), Phytonadione (vitamin k), Echinacea Angustifolia, Escin (horse chestnut), Melaleuca Alternifolia (tea tree oil), Xylitol (plant origin), Sodium Hydroxymethylglycinate (protein origin), Citric Acid, Cl 75810 (chlorophyll - natural colouring). I have used this product for many years, first bought in Belfast N.I. and have used it ever since,owing to ill health I have not been to Ireland for some time, and found you through Google. Really good toothpaste, does what it says with no aftertaste.